Prominent & Leading Manufacturer from Rajkot, we offer pendent push button station. Push Button Pendant Station are available to fit a wide variety of applications from the simplest one motion hoist to three-motion cranes with multiple switches and accessories. 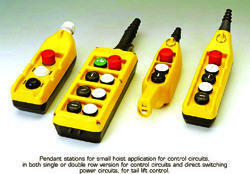 These Crane Push button switches are best quality, CE certified Products.